Fridge Locker Keeps Your Food Safe | OhGizmo! Living with a roommate can be an interesting experience. Splitting the rent and having someone to hang out with all the time can be fun, but fighting over food in the fridge isn’t. Nothing is worse than going into the kitchen, only to find that they’ve taken your last slice of leftover pizza or swiped the last beer. Sure, you’ll talk to them about it, and they’ll claim not to do it again (or that they never did in the first place) but some people never learn. That’s why someone created the Fridge Locker. 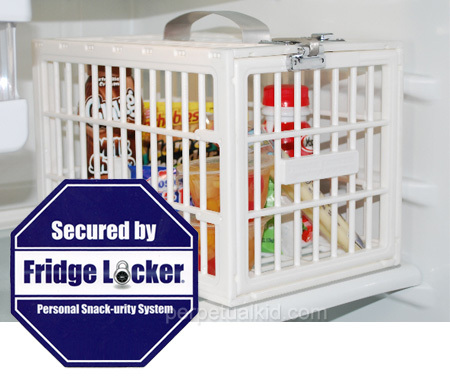 The Fridge Locker is a small cage that you use for storing your own private food. The metal combination lock keeps your food safe from “Refrig-A Raiders” (poor joke courtesy of the manufacturer). It measures 7.5” wide, 7.5” tall and 11” deep. At $20, it could easily pay for itself with all of the food it keeps safe. Granted, your roommate will not take kindly to seeing this. Purchase and install at your own risk. I need this for the office. Someone steals food from the common fridge. Sometimes i spit in my egg sandwich, write my name on it and leave it in the fridge for the office pilferer. LOL!!! Ha ha ho ha he ha!!! *wipes tear* I'm sorry but that's just funny! I can't wait to tell my friends and neighbors. Disclaimer: My over the top acting is merely an exercise for my soon to be Hollywood career. That's funny, I spit in your egg sandwich too. I think it's a great idea. Makes me wonder why no one thought of this before. It's sad that we can't even trust or coworkers or roommates. I had loads of water bottles that have been stolen from my departments fridge, and I don't think it was by one of the coworkers in my department that did it. It looks like it would be easy to break, so if your roommate really wanted it, I'm sure he'd still get it. I don't see girls doing much stealing. We ask to take your stuff and usually guilt trip them into giving it up. I don't think I ever want to live with people who need to see a combination lock to stop them from stealing your food. Wow, this is a surprisingly good and simple idea. If my coworkers wouldn't freak out about having this thing in the fridge I'd pick one up. We have a simple Dilbert comic about not stealing lunches on our office's fridge. Even then, I think we're all mature enough to not steal someone else's food. Haha…this is a simple but needed idea. Should be required at every college…I'm sick of my roommates and their friends stealing my beers and food! Just get better roommates, mine and I have an understanding that if you finish something you replace it, and if you aren't old enough to replace it then don't drink it.. I wish I could but the school decides who you get stuck with! That's why I gotta get one of these!! This is exactly what my girlfriend needs to prevent her family from devouring the food she buys for her arguably healthier diet.